This is about 6 months late. Each year in about May or June I start to research color forecasts for the following year. I want to get an idea of the color trends for the year and use this as a springboard for designing for both web and print. For my source, I use projections for home and fashions which usually reference Pantone textile colors. I can’t afford yet another Pantone color fan so I have started to sample colors from the websites of various fashion design houses (Le Cuir, Lenzing, Prada) as well as the combined color forecasts from Pantone. I am not trying to get an exact match, just an RGB approximation. To find out more than you wanted to know about fashion trends, including color, visit the Fashion Trendsetter website. Links to the various sources for color trends are all under one roof. From these sources, I construct a simple color table, as shown below, and begin to build a swatch library in Illustrator. By sampling colors from the website to get the RGB formula and converting to the closest CMYK equivalent yields color specifications that are usually sufficient for my needs. I start with RGB for the widest gamut and convert to the more restrictive CMYK. For a more exact match, these sources often provide the Pantone color code. You could use a conversion algorithm for the RGB and CMYK equivalents, such as Per Bang has provided on his very useful website. Various color pairings and combinations can also found by exploring the Fashion Trendsetter website. More often however, I look at an expanded palette starting with the compliments of each color. Using the basic color table as a start, I’ll expand it by adding a layer that defines the compliments to visualize some potentially useful color pairings. And similarly, add another layer for the inverted colors to yield more interesting ideas. What is the difference between a color compliment and the inverse of the color? Adobe defines the color invert as the opposite value for each component in RGB colors. For instance, where R=100, the inverse would be where R = 155 (or, 255 – 100 = 155) and etc. for the values of G and B. The compliment changes each component of a color to a new value based on the sum of the highest and lowest RGB values in the selected color, subtracted from the value of each component to create new RGB values. For example, for a color with an RGB value of 102 for red, 153 for green, and 51 for blue, Illustrator adds the high (153) and low (51) values, to end up with a new value (204). Each of the RGB values in the existing color is subtracted from the new value to create new complementary RGB values: 204 – 102 (the current red value) = 102 for the new red value, 204 – 153 (the current green value) = 51 for the new green value, and 204 – 51 (the current blue value) = 153 for the new blue value. No, I didn’t sit there and do the math for each color. Illustrator does it from the Options menu of the Color panel (click in the upper right corner of the Color panel to open the Color panel Options). You can explore other combinations using a color from your color table as the base color by opening the Color Editor. A previous post is devoted to a basic explanation of how the Color Editor works. 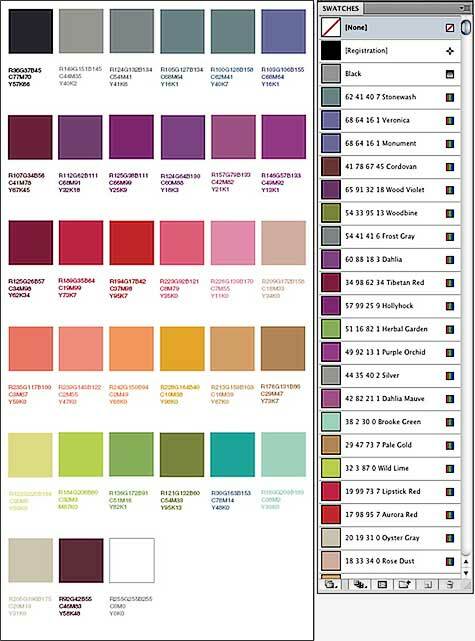 The reward for wading through this post is free download of the 2011 color chart for Illustrator, including the swatch library and complimentary/inverted color layers. This entry was posted on Saturday, November 27th, 2010 at 1:35 pmand is filed under . You can follow any responses to this entry through the RSS 2.0 feed. You can leave a response, or trackback from your own site.